The Austin Green Holiday Party comes together every December to celebrate our victories and regroup for the good fight in the coming year. 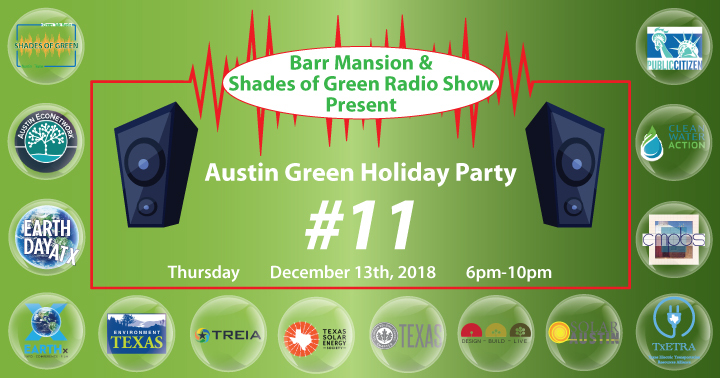 This will be our 11th year enjoying great friends, food, drink and music in a festive mixer that provides cross-pollination for a variety of great organizations. This year, 14 organizations are co-hosting. Experience how we are at the nexus of a merging of the environmental and food movements while enjoying a buffet featuring a variety of seasonal, all-organic favorites. We welcome the return of the magical sounds of Seu Jacinto, a group introducing and developing traditional Northeastern Brazilian culture to Central Texas. Seu Jacinto pays homage to the masters of the Brazilian folk musical traditions of forró, coco, cavalo marinho, and many other Northeast Brazilian rhythms. A big year is ahead so let’s enjoy our extended family and refresh our spirits for whatever comes next. We look forward to seeing you!